The sound of heavy rain wakes me. While it is still dark, getting back to sleep is out of the question: at half five my alarm will go off anyway. The weather forecast predicts a dry morning, with heavy thunderstorms in the evening – that’s something new! It rains until 9AM, but we are prepared. We can put on (“Donning”) the suit in our OPS tent. Something seems very different in here – its clean! Obviously, someone cleaned it yesterday evening. With the many visitors we get this is important, and at least one good side of the rainy weather: There is less dust! 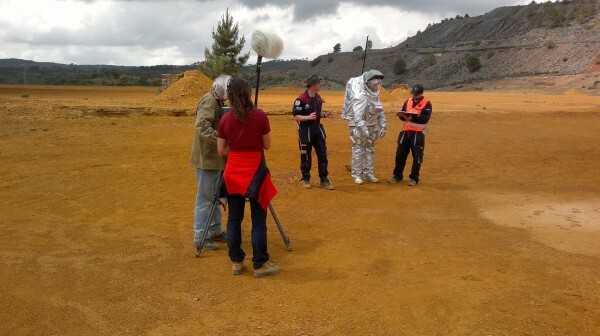 Several well known camera crews come to film our work. Technicians from Proell movies, Bayer Alpha, Discovery Channel and BBC World tread on each other’s toes in our large, but very crowded “HQ” tent. Every little thing we do gets documented on film – with a short interview explaining what had just been filmed. We are happy about that interest, even though we keep falling over cables and bump into oversized objects. But all in all – we do feel rather honored! Once Ulrich Luger is nearly done, we have to go outside under a make shift roof, fit the Hard Upper Torso and the antenna. Once the medical data have been taken and the life support systems are turned on, heavy rain starts again. In the meantime, Gernot Groemer gives an interview and our Rover Phileas is fimeld. Donning-Status: Suit and tester are ready, just the helmet has to be put on and a zip on the trousers is stuck. Shortly after 11am we are ready: there is a press conference taking place in the MCC, and we’ll join live per skype. Ulrich Luger gives two interviews: One to the MCC and one to the BBC. Once that is done, he starts his days real work – and has to turn back after only a few steps: It is raining again. The camera teams have found their new favourite motive: The water collecting in trenches around the OPS tent. At 3PM we finally get a “GO” – from both the mission control centre and the weather gods. The experiment “Lander Inspection” can take place! 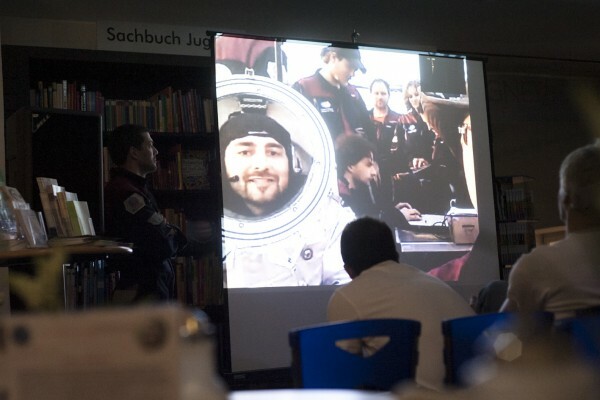 The astronaut has to check a model of a mars landing module and tries to find a certain number of damages. He is supported by our Rover Dignity. Also Eurobot gets allowed to go out – and human and robot cooperate to collect a big white box. If Uli slightly pulls on the box, Eurobot follows him in the desired direction. After this is done, the astronaut gets to go for a ride on top of Eurobot. Like in a real life scenario he goes up to rover Phileas and picks up a mining sample. At the same time we can perform a contamination vector experiment. Last but not least they head off to a “rock garden”, where dignity and Uli pick up several samples. This is heaven for the media teams – so much technical stuff hardly ever happens at the same time in one spot. But also for us it is important to finish several experiments at once, to get through our task list for the week! However, Ulrich still has work to do. 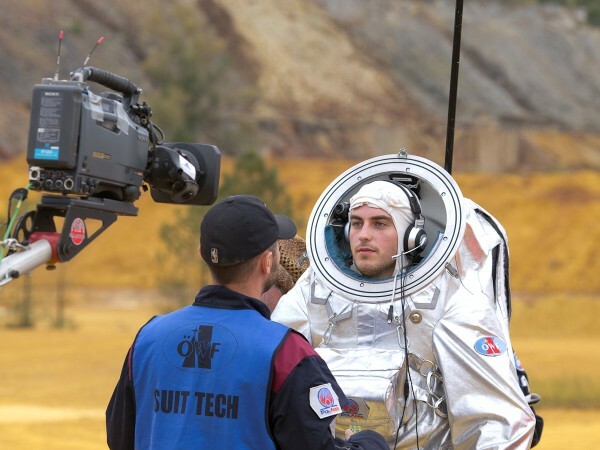 Photographs are taken and interviews need to be given – so he tells for the thousands time how it feels like to wear the suit and how physically demanding this job is. He explains what the exoscelleton is and what is its purpose. And how it feels like to drive around on Eurobot – “That’s simply the best! The machine is great, and the steering really smooth, it is amazing. I am honoured to being allowed driving around on this 1.5M Euro vehicle. Also the Eurobot team are impressed, and install some modifications at ther rear mirrors in no time. Apart from that, it is good to know that even such a large, expensive machine has to deal with “typical” inconveniences: Eurobot is steered with some kind of Joystick, and the driver has to push down continuously a dead man button. At one point, Uli releases the button to suddenly when someone shouts “Stop!”: the technician wanted to let him know that one task was done, and a new one can be begun. Uli got a different impression: “I thought I had just driven over something!” – an amusing thought, given that Eurobot is certainly not a formula 1 car! It is a long day, not only in spain but also in MCC. 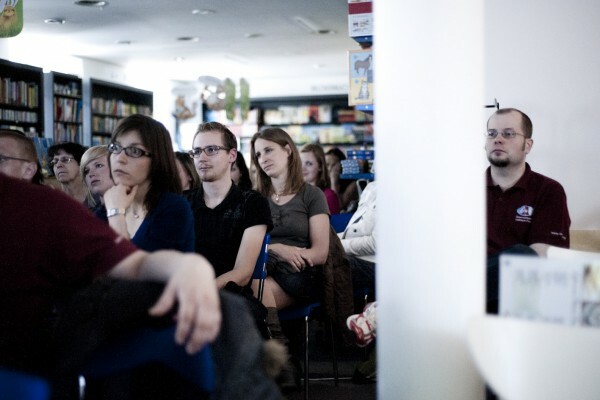 In the evening, the Innsbruck team still have an event planed in the Wagner bookshop. Again we join them using skype. This time we put Daniel into the suit and he sends our greetings back to Innsbruck. Finally, we are done. The media teams have left, and we can take a deep breath. Later that night another visitor stops by: The spanish photographer Juan Carlos Casado takes some night photos for his project TWAN („The World at Night“ https://www.twanight.org). While we head off to sleep, we hope that he finds some holes in the thick cloud cover above!